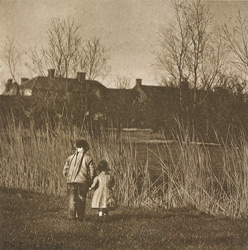 "Wandering in early spring, on a marsh rich with flowers, two village children have spied a fieldmouse which has quickly disappeared, running into the slight hedge formed by the thin growth of last year's battered reed. Beyond the reed there is a dike to carry off the flood-water, whilst across the dike and through the tracery of willows just budding into life, are seen the quaint cottages of a Norfolk village. In each cottage-garden the peasant is busily at work digging and planting for his crop of summer vegetables. The afternoon sun shines on the little figures, its warmth having attracted both mouse and children from their homes. A blue sky without a fleck of cloud adds to the beauty of the day and harmonizes with the golden ochres, delicate greens, brown greys, and reds of the picture."